Posted by dutchgrub	on Tuesday, February 16, 2010 at 11:31. 5 Comments. Broodje Bert is a small sandwich shop on a corner of the Singel between the Negen Straatjes and Kalverstraat. The appearance is distinctly Dutch. The location, the typical Amsterdam canal house, the small shop with the large windows and the name Broodje Bert all suggest thin slices of cheese on fluffy white buns. But step inside and you will immediately get a Mediterranean feel. There’s a great buzz, smell of fresh bread and herbs, and the friendly smile of the owner that makes the slight chaos appear to be part of some grand design. 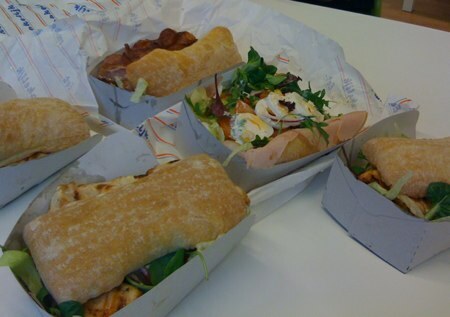 I went to Broodje Bert to get sandwiches for me and the others at the office. The logistics were a little difficult as Bert has no web site or menu online otherwise. He also only does take away and no delivery. So I cycled over, took a picture of the menu and sent it back to the office. Thank god for the mobile interwebs! I placed the order and had a good time with the others in the store, pretty much all of which seemed to be regulars knowing exactly what they wanted. You can also sit inside, at a small counter behind the large window and look out at the many bikes crisscrossing by. The sandwiches were large, messy and good. Broodje Bert is known for its grilled chicken sandwich which I tried. It’s a large, thin slice of chicken breast, grilled briefly, with lots of marinade. It’s blackened from the marinade going up in flames when turned over on the grill. The sandwich is garnished with lots of crunchy lettuce, corn and other greens, and drenched in lots of yummy garlic sauce. The healthy ham sandwich and the BLT with freshly sliced, crispy bacon also looked very good! And the burger with lamb meat on Turkish bread seemed very popular with the regulars. 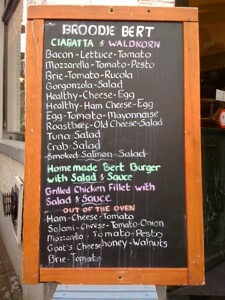 Broodje Bert is located on Singel 321, Amsterdam and open daily from 9am to 5pm. Filed under amsterdam, food, lunch, take away. These sandwiches look very fresh and appetising! It’s good to see that someone actually cares what he/she puts between two slices of bread! I’ll take note for when I go to A’dam for the day. I’ve had a few good sandwiches in Amsterdam. Pasta Tricolore does a great aubergine, red pesto and provolone sandwich. My only criticism of Amsterdamian Sandwich culture is the generous sized bread often overpowers the contents of the sandwich, and I feel a sandwich should be a partnership, not a competition. I thought the Sal Meijer sandwich was quite overrated. From what I’d read in Frommers and other blogs, the Sal Meijer Hot Partrami (Salt Beef) sandwich was supposed to be the find of Amsterdam but I found it quite an ordinary sandwich. Also I know I will probably spark some transatlantic foodie riot when I suggest that in my humble view, Calve is an inferior mayonnaise to Helman’s. I would agree with you about the partnership between the bread and the rest of the sandwich. My experience is that most are usually dominated by the bread as well. Usually, Hamburgers or Clubs are exceptions but it’s not a guarantee. As for your preference to Helmann’s over Calve…I agree, but have you tried Zaanse? Amazing! Cold and raw outside but lentil soup and chicken sandwich saved the day. Ask for extra sauce, it’s incredible. Great recommendation.